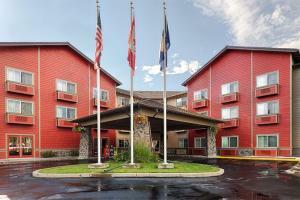 The great outdoors is yours at Best Western Rocky Mountain Lodge. Nature lovers appreciate the close location to Glacier National Park, Whitefish Mountain Resort, and Whitefish Lake for recreational sports. Shopping, bars and dining are within walking distance and the hotel’s free shuttle transports to and from the airport, downtown and Amtrak station. The lobby is warm and inviting with a rock fireplace and comfy lounge seating to kick start your day or wind down after a long one. Cozy accommodations offer the conveniences of home such as kitchenettes, fireplaces, jetted tubs and walk-in showers, depending on the suite or room type. Business travelers can expect favorable working conditions with peace and quiet, business services and equipped meeting facilities. Free breakfasts, free Wi-Fi, heated outdoor pool and hot tub, and laundry services add to its homey appeal. Glacier National Park, Whitefish Lake, and Whitefish Mountain Resort, shopping, golfing, fishing, skiing, hiking, zip lining, hunting, rafting and mountain biking.